Tension headaches sure are annoying and painful. In fact, they can make you feel extremely irritable. Besides, they completely ruin your motivation so much that you don’t want to work or go out for a social event. For people with chronic tension headaches, the effects can be worse. Depression, anxiety, and even anorexia may follow. There are many available treatments for this type of pain. Massage therapy is one treatment that often provides significant relief. Pain in your forehead, back of head, temples. It feels like your head is in a vice. You have the sensation that a band is tightening around your neck or head. Muscles between your head and neck contract. Why Do I Have a Tension Headache? Driving for a long time. 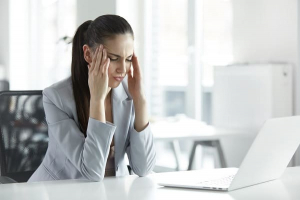 It seems like massage therapy has been shown effective for tension headaches in scientific studies, including one where tension headache sufferers showed significant improvement after four weeks of regular massage therapy. Myofascial release, including work on the deltoids. Axial cervical traction, including massage to the head and neck. Trigger point therapy, including locating trigger points and applying pressure. Specific stretching techniques directed by the massage therapist. As a result, patients had fewer tension headaches. Second, they noticed that their headaches were less intense. Finally, they were still seeing the benefits weeks after the treatment ended. Most importantly, massage therapy treatment for tension headaches needs to be done by a Registered Massage Therapist. At Davie Village RMT, our therapists are highly trained in massage techniques designed to relieve pain. Certainly, when you come to Davie Village, the massage therapist will begin with a thorough assessment of your general condition and your current problem. After that, they provide treatment specific to your unique needs. So, if tension headaches are making your life miserable often or just occasionally, you can talk to a massage therapist at Davie Village. Just book an appointment online. Your RMT is ready to help.